We are in absolute awe of Ellen Fisher- The Mango Island Mamma and we cannot take our eyes off her beautiful family and the delectable food images that she shares on her Instagram account. When the whole world is going one way, it seems like Ellen and her super adorable family is more than happy to walk away in an entirely different direction. With a raging YouTube account and with followers increasing at a super fast pace, “Ellen Fisher” is hurriedly racing towards becoming the next big thing in the world, or let’s say social media. She isn’t much of an ‘interview-person’ because she is just too busy raising two gorgeous kids, managing multiple social media platforms and being a spokesperson of veganism thereby promoting love, compassion and respect for all living creatures. What makes her unique is her decision to be different and her commitment to stay true to that decision for life. The Daily Brunch has managed to gather some insights on her super-enthusiastic life because we believe that Ellen is a role model and her way of life is worth emulating for the conservation of our environment and sustainability of the planet. Let us find out more about this intriguing personality, and dig deeper to know about her simple, yet wild and healthy lifestyle. Ellen’s positive vibes, and delightful outlook towards the world, are catchy and real. Known as a true follower of raw vegan diet, Ellen and her family live in the beautiful island of Maui, Hawaii, and follow the 80/10/10 diet, cruelty-free living like devotees. She is also the writer of an e-book called “Epic Raw Foods” that consists of recipes on how to prepare raw vegan food, and some beneficial health tips! Ellen has two little sons named Elvis and Sandy. The internet was abuzz, talking about how stunning and fit she looked as a mom-to-be while being on a vegan diet. It is indeed great to find that her husband Andrew shares the same passion as her, and has chosen to be a vegan. However, when Ellen first decided to opt for it back in college, he as her boyfriend back then, had found the idea totally crazy and had said he would never turn vegan! Her health journey began in 2006, and you cannot guess by seeing her pictures now that she was a victim to the eating disorder anorexia! Yes, and she desperately wanted to get rid of it, because of which she almost became underweight for eating just about 600 calories a day. That’s when she came across a friend who introduced the concept of raw food diet to her. Ellen initially started off with eating avocados, nuts and superfoods, and gradually turned up to bountiful fruits and vegetables as a part of her diet. However, she felt that something was still missing, and that is when she read Dr. Douglas Graham’s book “The 80/10/10 Diet”. She never looked back thereafter, as her health issues almost disappeared, and she became increasingly drawn towards the subject of being and living healthy! She and her family thrives on super healthy foods and makes sure that they get their share of sun, sand and family time every day. Ellen’s life itself is her message. 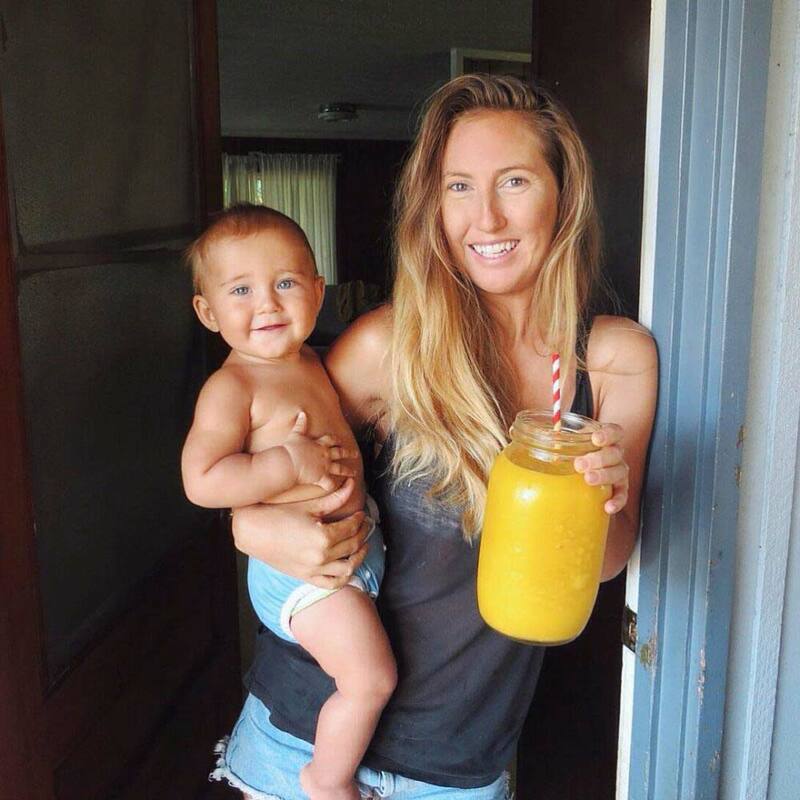 Our mango island mamma talks about why one should work out, eat healthy, stay healthy and most importantly about the importance of breastfeeding through her YouTube videos. With her current lifestyle, all her passion for unhealthy foods has driven away, and she tells us how her life has become increasingly positive with the way she lives at present. What we adore most about Ellen is her message to her kids and the future generations that the true joy of living comes from the simpler pleasures of life. You don’t have to buy expensive gifts to please or entertain your child. Your child must learn to appreciate the gift even if it comes in the form of dry twigs to little hand-me-down trinkets. Ellen has given home births to her two sons, and fed them only raw vegan food since their inception! She believes the first step of being a good parent is to “ask for help” from others, when you’re trapped in a doubt. She also believes in protecting the future generation of animals, instead of killing them and eating them up. She wants everyone on planet earth to stay happy, and live harmoniously altogether! Being a mother, she also works to help other mothers and their children to follow a nutritious diet with her blogs and recipes on her e-book! And yes, she is just like us, she is an informative book junkie (reads subjects that she is fond of), and is a social media person totally! She is an active user of Instagram, Facetime (which she mainly uses to connect to her sister), and also has a YouTube page of hers! And she uses an iPhone! Also in spite of receiving flaks from people over social media, for her chosen lifestyle, she chooses to not be affected by the negative comments and simply chooses to move on because she has a pretty awesome life to enjoy. More power to you Ellen for you are a true inspiration!